Another beauty introduction from Lisa Cocuzza's It's A Glam Thing! Going out on the town or to a special event is a perfect way to give yourself the excuse to pamper. You should never neglect to show off your locks and what better way to do that than add some sparkle, some bling to your fabulous up do or style? Enter Bling Jewels ~ a wonderful final touch to any hairstyle! 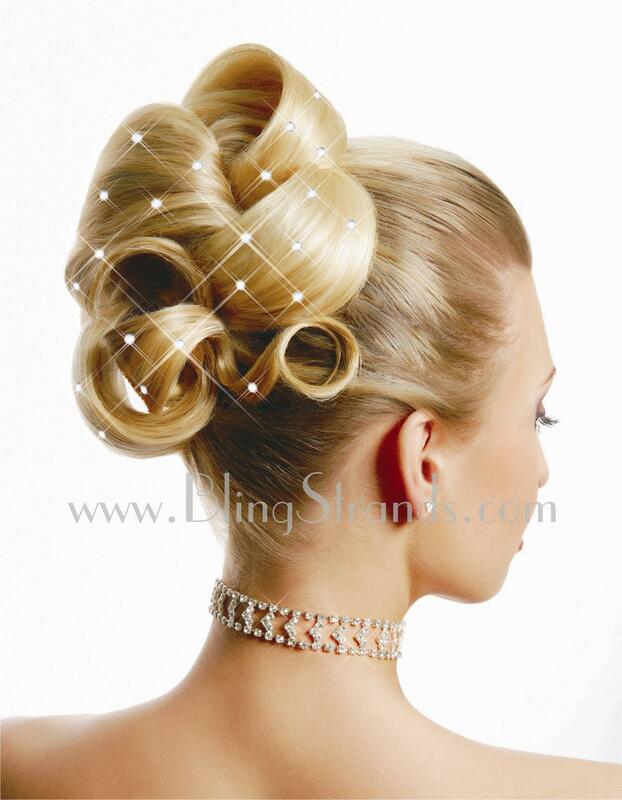 Bling Jewels will add sophistication and dazzle to your hair just like diamonds. Jewels should be attached to finished hairstyles. Perfect for brides, prom, and formal up-do's and even gives sparkle to your everyday hairstyle. Whether you are looking to glam up a formal look or add some color to finish your funky style, Bling Jewels, made with genuine Czech crystals, are a perfect addition to ensure you are noticed! sapphire and pink or blue topaz! Predictably, my daughter and her friends loved experimenting with Bling Jewels and plan to glam up with them for their next formal. Looking to glam up your tresses? You're in luck! Courtesy of It's A Glam Thing and Bling Strands, one of my readers will win a pack of Bling Jewels! You must follow That's What She Said via Google Friend Connect (mid right sidebar) to enter this giveaway. This giveaway is open to residents of the US & Canada, 18+ and will conclude on Saturday, April 23, 2011 at midnight EST. Winner will be randomly selected from all eligible entries and notified by email. Winner will have 48 hours to respond before I move on to a runner up. Please leave your email address in your entry comments, if it is not available via your comment name, so I can contact you if you are the winner. You must follow That's What She Said via Google Friend Connect (mid right sidebar) to be eligible to enter. For mandatory entry, please "like" Bling Strands on Facebook and leave a comment here with letting me know and including your Facebook name. * "Like" Lisa Cocuzza & It's A Glam Thing" on Facebook, leave a comment here letting me know, with your Facebook name, 3 entries. * Visit the Bling Strands website and tell me in a comment which of their products you'd love to try and why, 3 entries. * Visit It's A Glam Thing and tell me in a comment what you love most about the site, 3 entries. * Follow Lisa & It's A Glam Thing on Twitter, leave a comment here letting me know and including your twitter name, 3 entries. * Follow That's What She Said (tsue1136) on Twitter, leave a comment here letting me know and including your twitter name, 3 entries. * Tweet about this giveaway. Please include @lisacocuzzaIAGT and @tsue1136 as well as a direct link back here in your tweet. 2 entries per tweet. Max of three tweets per day. * Subscribe to That's What She Said via email or RSS feed (mid right sidebar) and leave a comment with your applicable name, 3 entries per method. * Enter any of my other active giveaway and leave comment here letting me know which, 3 entries per additional giveaway. * Comment with a relationship or love question for Patti Stranger of Millionaire Matchmaker via this post, 10 entries. * Share this giveaway in some fashion other than tweeting. Anything goes: post on facebook, blog, stumble, technorati, blog group board, post to giveaway linky... just leave a comment with a link to your sharing. 5 entries per sharing method. Congrats to Huguette, comment #134, courtesy of Random.org! ON BEHALF OF IT'S A GLAM THING, BLING JEWELS AND THAT'S WHAT SHE SAID, THANK YOU TO ALL ENTRANTS FOR FOLLOWING AND PARTICIPATING! I was provided with a pack of Pink Topaz Bling Jewels to explore for the purposes of creating this review. The opinions expressed above are both honest and my own. Information and images taken from various Bling Strand and It's A Glam Thing sites. Prize and shipping is responsibility of sponsor. Id love to try the WaaLaa Teasing Comb,i have fine hair so i have to tease for a lot of updo's,this would make it easier. liked bing strand on facebook. I am a fan of Bling Strands on Facebook. I added Lisa Cocuzza & It's A Glam Thing as a friend on Facebook. At Bling Strand, one product I really like is the Sizzling Cranberry Bling Strands. They have great hair products to choose from. At the It's A Glam Thing website, I really like the organization of the site. Information is readily available to find. They have a great variety of topics and I love the videos. I am following Lisa & It's A Glam Thing on Twitter. Like on FB (Huguette En) Link took me to friends, so friend request sent as well.